MIAMI BEACH, Fla., April 17, 2019 /PRNewswire/ -- The 18th annual Food Network & Cooking Channel South Beach Wine & Food Festival (SOBEWFF®) drew more than 65,000 guests to EAT. DRINK. EDUCATE. February 20 – 24, 2019. This year's Festival consisted of more than 110 events, spanning Miami-Dade, Broward and Palm Beach counties, and raised approximately $2 million for the Chaplin School of Hospitality & Tourism Management at Florida International University. 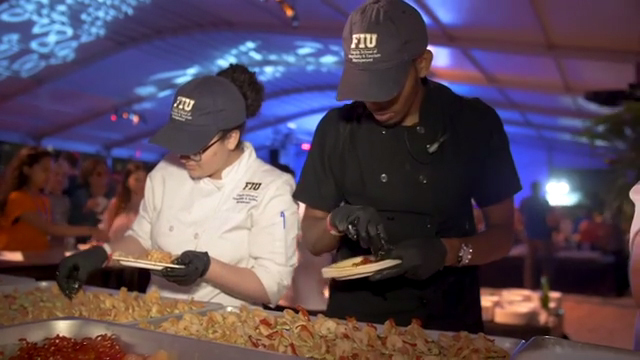 Widely known as one of America's favorite gourmet gatherings on the beach, the Festival has raised more than $30 million since its inception to support the education of the future leaders of the hospitality industry. Respected author, editor and former restaurant critic Ruth Reichl served as the master of ceremonies at the Festival's annual Tribute Dinner presented by Bank of America part of The NYT Cooking Dinner Series at the Loews Miami Beach Hotel on Saturday, February 23. This year's dinner honored two pioneering women in the food and beverage industry who are carving a path for future generations – acclaimed chef and restaurateur Nancy Silverton and Ferrari-Carano Vineyards and Winery chief executive officer Rhonda Carano. Led by Loews Miami Beach Hotel executive chef Frederic Delaire, a celebrated roster of chefs prepared the evening's meal, including: Dominique Crenn, Carolina Diaz, Gabrielle Hamilton, Ashley Merriman, Dahlia Narvaez and Missy Robbins. Miami-based restaurant PINCHO reclaiming the Heineken Light® People's Choice Award on Friday, February 22 at the Heineken Light Burger Bash presented by Schweid & Sons® hosted by David Burtka & Neil Patrick Harris. Celebrated South Florida mixologist Ben Potts being crowned the Art of Tiki People's Choice and Overall Throwdown winner at Art of Tiki Cocktail Showdown presented by BACARDI Rums hosted by Ted Allen on Friday, February 22. The Coca-Cola Beachside BBQ Award was presented to Big Bob Gibson Bar-B-Q, from Decatur, AL on Saturday, February 23 at the Coca-Cola Beachside BBQ presented by The National Pork Board hosted by Guy Fieri. Chef Richard Plasencia of Miami-based restaurant Twisted Fork Kitchen was named Swine University's Valedictorian by a panel of judges, which included Ana Quincoces, Eddie Zamora and Patrick Ban, at Goya Foods' Swine & Wine presented by The National Pork Board hosted by Eileen Andrade & Fernando Desa on Sunday, February 24. The 18th annual Festival brought a variety of musical entertainers to delight fans at several events. This included performances from GRAMMY® Award-nominated artist Cassadee Pope, GRAMMY® Award-winner and 90s icon Rev Run, the Coral Gables, FL-based Nu Deco Ensemble, as well as Ludacris and Cedric Gervais during the featured David Grutman Experience. Popular musician DJ IRIE provided the beats at two Festival events during the weekend, including Taste Jamaica presented by Jamaica Tourist Board and TEF hosted by Cindy Hutson & Delius Shirley on Friday, February 22 and Goldbelly presents Sweets & Beats hosted by Cake Boss Buddy Valastro & Joe Ariel on Saturday, February 23. A Dinner hosted by Elizabeth Karmel, Martina McBride and Philip Kistner at Township on Friday, February 22. An evening Clambake hosted by Alex Guarnaschelli and Jorge Ramos at Conrad Fort Lauderdale Beach on Friday, February 22. The newly debuted Drag Brunch presented by Barilla hosted by Alex Carr and Elvis Duran on Saturday, February 23 in collaboration with the team at PRIDE Fort Lauderdale. Fan-favorite Bloody Mary Brunch hosted by Jeff Mauro & Geoffrey Zakarian on Sunday, February 24. The physical footprint of the Festival expanded once again in 2019, featuring two events in The Palm Beaches – both presented by Discover The Palm Beaches – for the first time. The first was a Dinner hosted by Clay Conley, Martha Stewart and Lindsay Autry, taking place at Autry's own The Regional Kitchen & Public House on Thursday, February 21; followed by a Dom Pérignon Masterclass that took place at the Virginia Philip Wine Spirits & Academy on Saturday, February 23. Many additional events, seminars, interactive classes, panels, and more rounded out the Festival weekend. In total, the Festival served up more than 5,500 cases of wines and spirits from valued brands part of the Southern Glazer's Wine & Spirits portfolio, and featured more than 450 chefs, winemakers, spirits producers and lifestyle personalities. SAVE THE DATE: SOBEWFF® will return for its 19th annual edition February 19 – 23, 2020. Stay up to date all year long by following along with the #SOBEWFF hashtag on Instagram, Twitter and Facebook. EAT. DRINK. EDUCATE. All proceeds from the Festival benefit the students of the Florida International University Chaplin School of Hospitality & Tourism Management who also assist Festival organizers with sponsorship fulfillment, restaurant and exhibitor recruitment, logistics, and inventory as well as working alongside some of the world's greatest celebrity chefs and winemakers. To date, the Festival has raised more than $30 million for the School. In September 2018, BizBash named the Festival the #1 Food & Restaurant Industry event in the United States for the sixth year in a row. The Food Network & Cooking Channel South Beach Wine & Food Festival is produced by Florida International University and Southern Glazer's Wine & Spirits, with the support of the Miami Beach Visitors & Convention Authority and the Miami-Dade County Department of Cultural Affairs. For more information about the Festival, visit sobewff.org or call 877-762-3933. For more information about Florida International University visit fiu.edu, for the Chaplin School of Hospitality & Tourism Management visit hospitality.fiu.edu and for more information about Southern Glazer's Wine & Spirits visit southernglazers.com.